Norway's most acclaimed living polar explorer and one of the greatest adventurers of our time, Erling Kagge was the first person to surmount the "three poles" North Pole, South Pole and Mount Everest. For the past 15 years, he has been setting new standards in exploration, living up to his motto: "If you can dream it, you can do it." Skiing to the Earths extremities, sailing the oceans, climbing mountains and reaching beyond himself have been Erling Kagges goals since childhood, ambitions inspired by his boyhood heroes, fellow Norwegians Roald Amundsen and Thor Heyerdahl, as well as Albert Schweitzer. Kagge had already sailed across the Atlantic twice, around Cape Horn and to Antarctica and back by the time he received a law degree from the University of Oslo in 1989. For two years during this period, Kagge worked as a lawyer for industrial giant Norsk Hydro. In 1996, after a years sabbatical reading philosophy at Cambridge University, he founded what is today one of Scandinavias most profitable publishing houses 'Kagge Forlag'. In addition to running his business, Kagge lectures frequently to geographical societies and business organisations. His three books on his polar expeditions have sold more than 60,000 copies. "Not everyone can do what I did, but I recommend that each person finds his own South Pole," says Kagge. 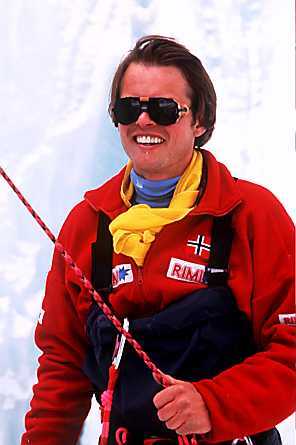 1994 : Kagge summited Mount Everest, becoming the first person ever to attain those three extremes of Earth. 1992-93 : In 1992-93, he completed the first unsupported solo expedition to the South Pole (starting from Berkner Island), covering the 814-mile (1340 km) route in 51 days. 1990 : With Børge and Geir Randby, Kagge set out from Ellesmere Island in Canada for the North Pole without receiving any supplies underway. Randby had to be picked up due to an injury, but Ousland and Kagge completed the trip in 58 days (March 8 to May 4, 1990). This was the first unsupported ski trek to the North Pole; a distance of 800 km. This exploit features on the cover of Time magazine.